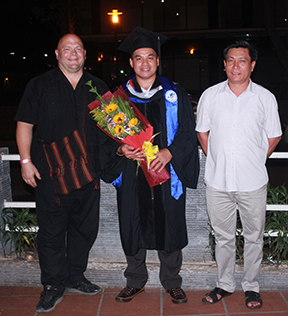 Initial Formation Candidate, Vincent Tinh Cao, graduated on October 7th from Open University in Saigon with a degree in sociology. According to Sr. Hang Pham, ASC who lives in Saigon and who has a Master Degree in Social Work from United States, sociology is an up-and-coming degree in Vietnam. People are beginning to see the important applications of education in this field of education. Sr. Hang has worked with colleagues who graduated from Open University in Saigon who highly regard their education there. Vincent Tinh Cao is now better prepared to fulfill some of the key components of formation in our Congregation. He is able to consider the formational values of social awareness, solidarity with the world, concern for justice and cross-cultural sensitivity. Tinh can now continue to prepare for mission in our Community with this background which has enabled him to appreciate learning about other cultures and languages. Currently, Tinh is studying for his TESOL exam in order to enter philosophy school. This exam tests his English abilities.